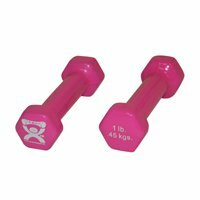 CanDo 10-0550-2 Vinyl Coated Dumbbell, 1 lb, Pink Pair (Pack of 2) by Cando at Strongman Pictures. MPN: 10-0550-2. Hurry! Limited time offer. Offer valid only while supplies last. Vinyl coated, color-coded cast iron dumbbells are ideal for upper body exercises, or for physical therapy, weight training, and toning workouts.